韦妹妹很小师从我国著名小提琴家谭抒真教授。1979年考入上海音乐学院后，从师于盛中华和袁佩文教授。1985年大学毕业后获得南加州大学最高奖学金赴美留学. 在Eduard Schmiede博士的指导下获得音乐硕士学位。1990年硕士毕业后，韦妹妹考入美国凤凰城交响乐团第一小提琴。1999年考入美国路易斯安娜爱乐乐团副首席. 2003年她随后又获得美国路易斯安娜州立大学最高奖学金，在Kevork Mardirossian教授的指导下，获得小提琴演奏博士学位，-韦妹妹也曾师从过世界著名小提琴大师Shmuel Ashkenas. Mei Mei Wei A winner of the Artists International Violin Competition in New York, She was invited to play solo recital in Carnegie Hall. Her performance was highly praised by the” New York Concert Review”. Active recitalist and chamber musician, Mei Mei Wei has appeared throughout United States and her native China. 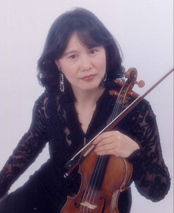 As soloist and chamber musician ,she appeared with many American and Chinese orchestras and festivals such as, Arizona Chamber Symphony, Louisisana Philharmonic Orchestra, National Repertoire Orchestra in Colorado, Shanghai Musician Association Chamber Orchestra, Bay Chamber Music Festival with Vermeer Quartet in Maine, East Meets West Music Arts Chamber Orchestra of Chicago, RoundTop Music Festival of Texas, Music Alive Ensemble of New Orleans, etc Born into a family of artists in Shanghai, China, Mei-Mei Wei studied with Professor Tan Shu-Zhen, one of the most eminent violinists and violin pedagogues in China. After graduated from the Shanghai Conservatory of Music. She went to US on a fellowship to study, first at Rice University and then at University of Southern California where she received her Master’s deree under Edward Schmieder, a pupil of the legendary Russian violinist David Oistrakh . She also studied with legendary violinist Shmuel Ashkenasi. Mei Mei Wei received her Doctor of Musical Arts degree at Louisiana State University where she studied with Kevork Mardirossian. Mei Mei Wei has held the positions of Associate Concertmaster of Louisiana Philharmonic Orchestra, First Violin section of Phoenix Symphony. She has been on the faculty of Louisiana State University, The Colburn School Conservatory of Music, the Idyllwild Summer Music Festival in California in US. After returning to China in 2008,Mei Mei Wei was appointed as the Music Director, Soloist, and Concertmaster of the Shanghai Baroque Chamber Orchestra. Over the last ten years, she has been successfully leading the orchestra plays at the most well-known concert halls in China such as the Shanghai Oriental Arts Center. Shanghai Grand Theatre, Shanghai Concert Hall, Qingdao Grand Theatre and Chongqing Grand Theatre etc,.where she often plays solo with orchestra, chamber music and chamber orchestra concerts and and has gained popularity among Chinese audience. She has collaborated with world class artists such as Shumel Ashkenasi, Alexander Shtarkman, Kevork Mardirossian and Dennis Parker etc,.to play solo recital and chamber music. Mei Mei Wei is wellknown as a soloist, chamber musician and her orchestra is becoming one of the best chamber orchestras in China. 2013 Mei Mei Wei was selected as “ Thousand of People Plan ”, its an over seas high-level talent introduction program by China goverment. Mei Mei Wei has taught at The Shanghai Conservatory of Music -Precollge Division and the Music School of East China Normal University. Every summer she teaches at the Manhattan International Music Festival and plays solo recital and chamber music with famous artists around the world.